The next IMPD Northwest District “Coffee With a Cop” will be this Tuesday, November 20th, from 9:00 a.m. – 10:00 a.m. at the Walmart/Subway located 4545 Lafayette Road. 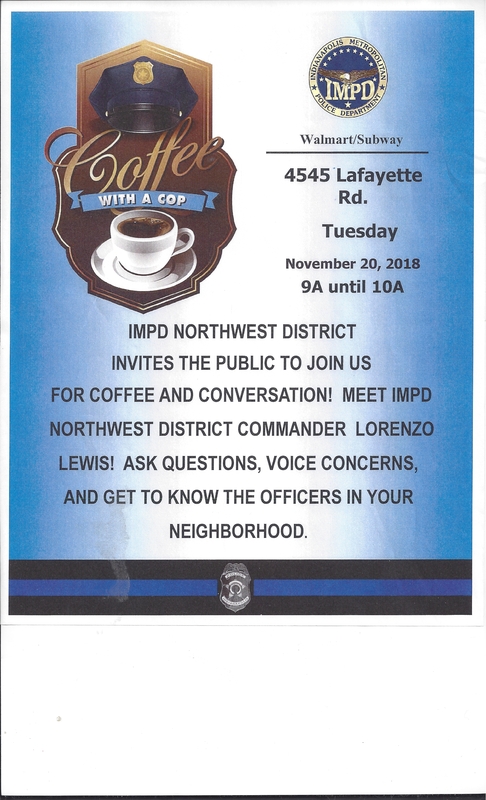 This is a great opportunity for you to join the officers and Commander Lewis for some conversation, ask questions, and voice concerns about not only our area, but all of the IMPD Northwest District. They work hard for us every day – let’s show them how much we appreciate everything they do. Drop by and say “Hi”, if only for a few minutes. I know it would mean a lot to them. 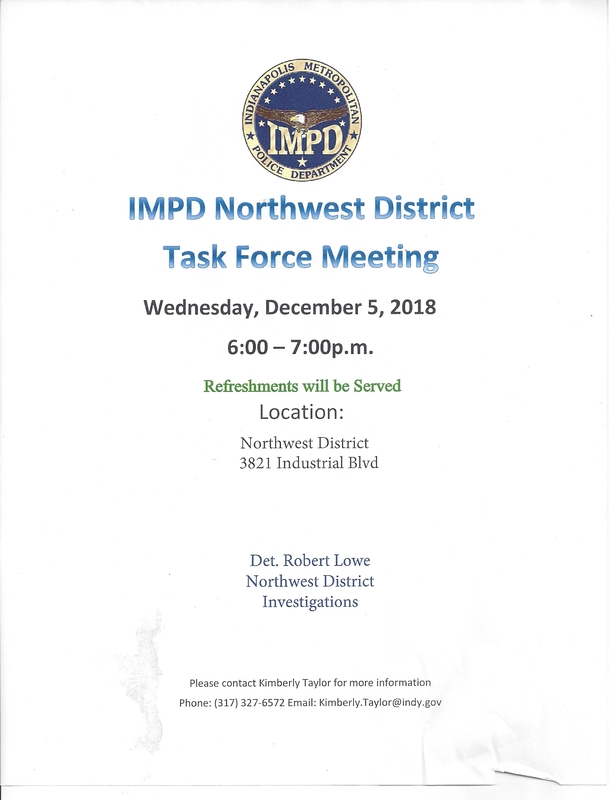 The monthly Task Force Meeting for the Northwest District will be held on Wednesday, December 5th, from 6:00 p.m. – 7:00 p.m. at their Northwest District Headquarters, located 3821 Industrial Blvd. This month Detective Robert Lowe from Investigations will be the main speaker. These meetings are always quite informative and helpful. Refreshments will be served. Hopefully many of you will be able to attend this as well . I have attached flyers for both events. Please feel free to share this information with others, not only in our Council District but throughout IMPD’s Northwest District. I know that IMPD’s Northwest District would appreciate you helping to spread the word.